GGTI-2418 is a synthetic peptidomimetic inhibitor of geranylgeranyltransferase I (GGTase I) that appears to induce apoptosis by downregulating several pivotal oncogenic and tumor survival pathways. CID-1067700 is a pan GTPase inhibitor, and competitively inhibits Ras-related in brain 7 (Rab7) with a Ki of 13 nM. MRTX-1257 is an irreversible covalent inhibitor of KRAS G12C with antitumor efficacy. AMG510 is a potent KRAS G12C covalent inhibitor. Rhosin is a specific Rho inhibitor; binds to WT RhoA with an affinity ~0.4 uM Kd; does not interfere with the binding of Cdc42 or Rac1. 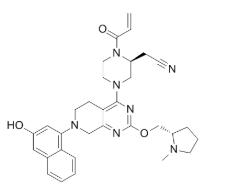 Kobe0065 is a novel and effective inhibitor of Ras-Raf interaction, competitively inhibiting the binding of H-Ras·GTP to c-Raf-1 RBD with a Ki value of 46±13 μM. KRas G12C inhibitor 2 is a compound that inhibits KRas G12C, extracted from patent US 20180072723 A1. 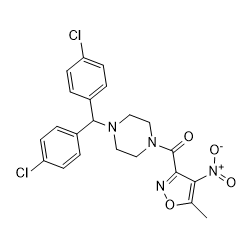 K-Ras(G12C) inhibitor 12 is a K-Ras(G12C) inhibitor, the half-maximum effective concentration (EC50) for K-Ras(G12C) inhibitor 12 in H1792 cells is 0.32 μM. ML-210 is a small molecule that is selectively lethal to mutant RAS oncogene-expressing cell lines (IC50s = 71 and 272 nM in HRASG12V-expressing and non-expressing BJeH cells, respectively). GGTI298 Trifluoroacetate is a CAAZ peptidomimetic geranylgeranyltransferase I (GGTase I) inhibitor, which can inhibit Rap1A with IC50 of 3 μM; little effect on Ha-Ras with IC50 of >20 μM.